Double nylon lined neoprene 1.5mm with full inner hand Amara leather doubler. This provides added thickness and strength where needed to give lasting durability for people requiring a glove with abrasive resistance. Particularly useful for bottom scratching, cray diving, rock hopping off barnacle rocks, etc. Has an elasticised velcro adjustable wrist strap for tight fit on the wrist.This glove is much tougher than any plain neoprene glove. 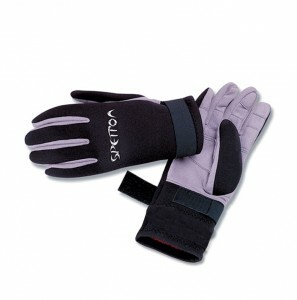 Click the button below to add the Spetton Amara Gloves to your wish list.